Traditional means of getting your customer’s attention is getting harder and harder which is why content marketing is growing in both popularity and impact. The strategy of content marketing is to constantly provide highly relevant and informative information that your customers are looking for. The important words here are constant and high quality. Your customers want to learn about you, your company and the solutions that you might be able to give them. In fact, you may have seen our content marketing in use on this site. If you came to this page through the home page of our site, you were greeted by an offer to download our latest white paper on digital marketing. If you glanced at our navigation you noticed our digital marketing resource area that contains a number of thought provoking papers on different digital marketing topics. Through the use of our content marketing strategy, we are trying to help you get the information that you are looking for, and we are trying to help you learn about an industry that, currently, can be pretty confusing. Time, expertise, publish. Content marketing is an amazing component to your marketing strategy but who has the time to put into creating content. There is an expertise to writing content that converts, and then where to go to get that content out in front of your customers. It’s a lot of work. Here is a great illustration of a periodic table that was put together by Chris Lake. 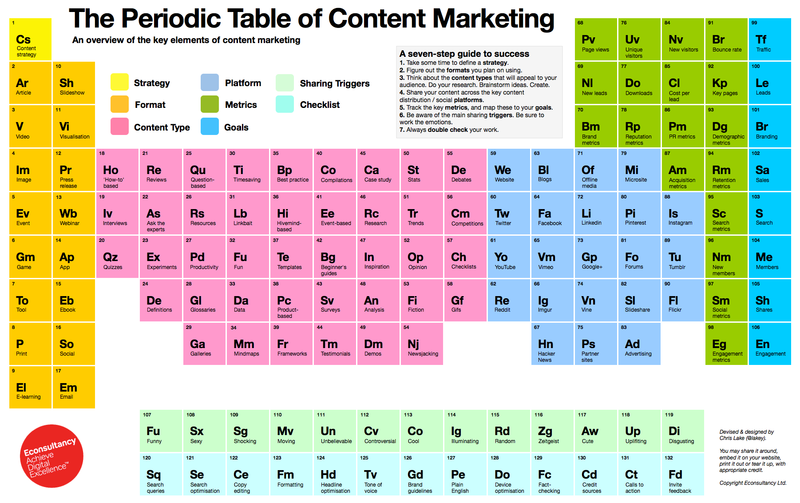 In this table you’ll find the various strategies, formats, content types, platforms, metrics, goals, and more. Want Some Help Getting More Content?